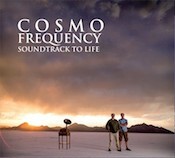 Looking around the music community, I find that I may be of the minority opinion when it comes to Soundtrack to Life, the debut from duo Cosmo Frequency. Where others are hearing a diverse range of approaches, I am hearing someone with a checklist of standard New Age tropes, systematically checking them off as we go. Dramatic echoing voice reciting the start of our narrative? Check. Angel-choir pads? Check. Whooshing space wind sounds? Check. Romantically swelling piano over a steady Vangelis-style bass pulse? Check. Pan flute for world flavor? Check. Breathy Enya-esque vocals? Check. On and on. Throw in some thumping techno to represent the artists’ DJ’ing background, and there’s Soundtrack to Life. My problem with the album is that it comes off as hugely unoriginal, despite being well-played and well-produced. Paul Martinson and Brent Vincent are clearly talented musicians–multi-talented, in fact–but the music here is overburdened with the weight of all the artists they’re trying to emulate. Given how well this release has done on various charts (Echoes Top 25 in November 2013, nominated for Best New Artist by Zone Music Reporter, etc. ), I suppose my opinion ought to be taken with a grain of salt. This just isn’t for me, but it’s clearly sitting nicely with others. Die-hard New Age fans probably want to check this out; just expect to hear all the things you’ve heard before, perhaps with a little extra pomp. Available from the artists’ web site. pretentious, IMO. So, you are not alone in your opinion (I just haven’t written my review yet). I also found the techno tracks a huge distraction from the spacy/EM theme of the album (or that’s how I heard it).